The holidays are an exciting time. You get a break from your college courses for a little bit which means a break from homework. You also get to spend a lot of time with family and friends and show them you care with gifts. One of the most fun parts about the holidays is dorm room decorating. Putting up dorm room decorations for the holidays will make your college dorm room feel even more like a home away from home and will make your college dorm room extra comfortable. 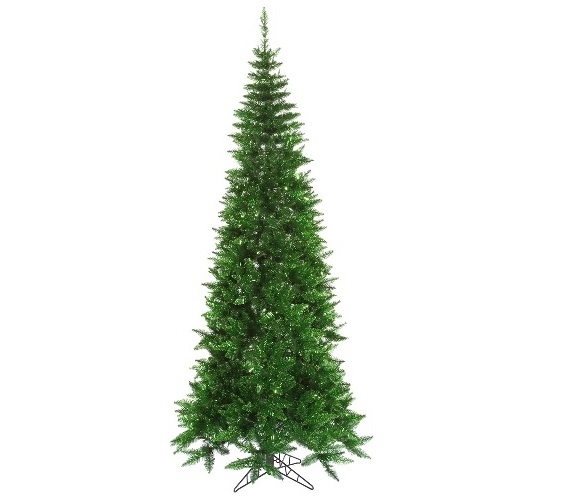 When you're putting together your college dorm checklist for the holidays, start with our 4.5'x24" Tinsel Green Slim Fir Tree. Our Tinsel Green Slim Fir Tree is a classic dorm Christmas tree. In a traditional green color like your family may have at home, your college dorm room will feel even more comfortable. The traditional color of the branches will allow you to add holiday dorm room decorations in any color to the branches for a traditional look that makes your dorm room decorations stand out. Our Tinsel Green Slim Fir Tree isn't just an ordinary dorm Christmas tree, though. The branches of this college supplies item have sparkling tinsel highlights for a subtle effect that is stunning when combined with your other dorm room decorations for the holiday season!